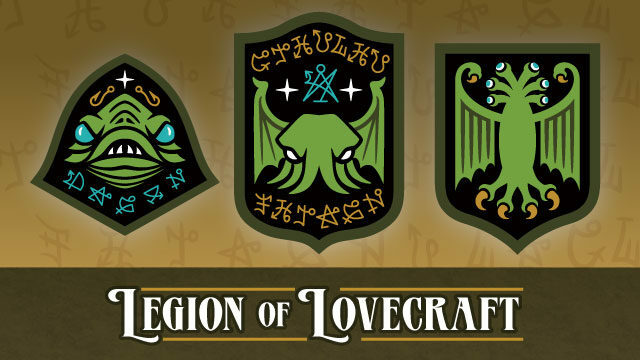 Legion Of Lovecraft, featuring monsters and alien gods from the writings of author H. P. Lovecraft: Cthulhu, Dagon and Elder Things is my current Kickstarter campaign, is now live! Rewards include patches, buttons, stickers and art prints. The patches are military-inspired and have heraldic shield design influences. The custom lettering was designed to evoke occult, alchemical and astrological symbols and sigils. The campaign funded in just over 2 hours, so these will be produced for sure! Pledge now to get good pricing, and qualify for FREE stretch goal bonus items! Launched on October 10, 2018, and runs until October 21, 2018.